<b>Imperial Throne set</b>. Lacquered wood, jade, and other material. Qing dynasty, Qianlong period. <b>Jar with 10,000 shou characters</b>. Porcelain with underglaze blue. Qing dynasty, Kangxi mark and period. <b>Ceremonial armour</b>. Cotton-padded, silk satin, copper studs, metal plate. Qing dynasty, Yongzheng period. <b>Bell set</b>. Gilt bronze and wood. Qing dynasty, Qianlong period. <b>Vase with 100 bats</b>. Porcelain with red and blue-green enamels. Qing dynasty, Qianlong mark and period. <b>Child emperor's ceremonial robe (chaofu) used by Emperor Tongzhi in 1861</b>. Embroidered silk and fur. Qing dynasty, Tongzhi period. <b>Portrait of Emperor Yongzheng in Western Costume</b>. Anonymous court painter, oil on paper. Qing dynasty. <b>Chicken cup</b>. Porcelain. Ming dynasty, Chenghua mark and period. <b>Coffee set</b>. Silver. Qing dynasty, late 18th century. <b>Imperial dog's outfit</b>. Silk brocade. Qing dynasty, Guangxu period. <b>Flask</b>. Cloisonne enamel on gilt copper. Qing dynasty, Qianlong period. <b>Ice box</b>. Cypress wood, metal fittings and lining. Qing dynasty, Qianlong period. <b>Sedan chair</b>. Gilt and lacquered wood. Qing dynasty. If The Forbidden City: Inside the Court of China’s Emperors has a mascot, it’s Emperor Yongzheng. 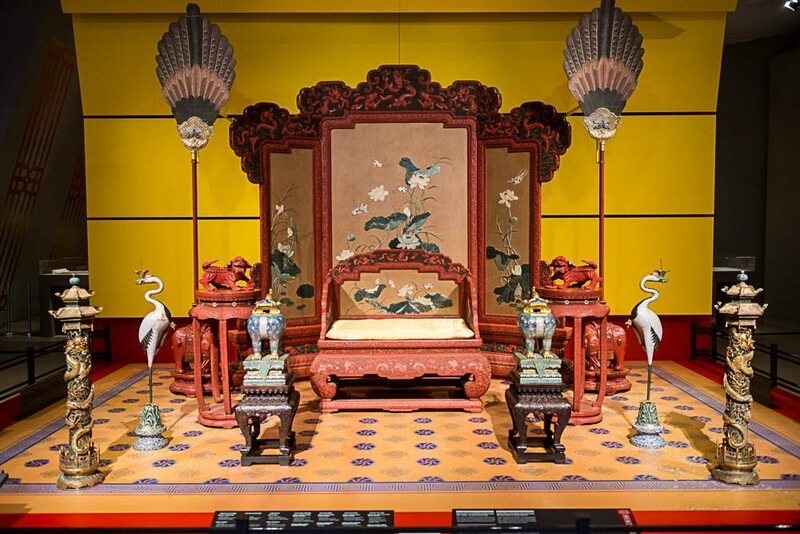 The image of the 18th-century Chinese ruler dominates the promotional material of the exhibition, which is one of the centrepieces of the Royal Ontario Museum’s centennial year. His portrait certainly has visual appeal, but Yongzheng is also a figure associated with surprising elements of life within the former imperial palace. Take, for example, a painting depicting Yongzheng bewigged and dressed in the style of King Louis XIV of France. Such costuming likely provided Yongzheng with a respite from his daily duties—according to the exhibit, his motto was “being ruler is tough.” While we’re used to seeing Western society adopt Eastern influences in its arts and fashion, it’s less common to view the reverse in action prior to the late 19th century. As contact increased with Europeans, the imperial court grew fascinated with elements of Western lifestyle: on display here is a miniature coffee set, whose tiny cups hint that courtesans might not have enjoyed drinking freshly brewed joe, but found the rituals surrounding its consumption intriguing. Travellers and Christian missionaries became part of the court, developing into artisans who blended elements of East and West in their work. The exhibit, which was announced last October, is dominated by the warm reds and yellows associated with the Chinese royal court. The displays reveal the arts, personalities, and rituals associated with the Ming and Qing dynasties—along with items ranging from tiny, delicate chicken cups to large orchestral instruments, the exhibit includes animated vignettes of court life inspired by shadow puppetry. The interpretive plaques offer the proper pronunciation for the names of prominent rulers, which taught us we’ve been saying “last emperor” Puyi’s name wrong for years (it’s “Fu-yee”). Appreciating the historical cross-cultural relationships evident in the exhibit, a collaboration between the ROM and Beijing’s Palace Museum, has value for us today, says Chinese ambassador to Canada Zhang Junsai: at yesterday’s media preview, he discussed the fact that, ideally, cultural exchanges like The Forbidden City: Inside the Court of China’s Emperors promote harmony by creating respect for and understanding of our historical and cultural differences.